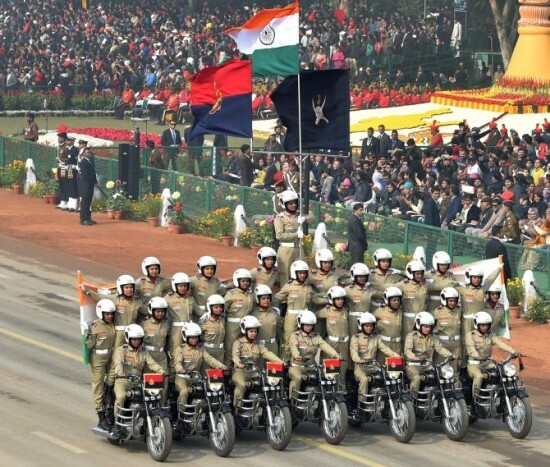 In one of the many firsts this year, a women contingent of the Border Security Force on Friday performed motorcycle stunts during the Republic Day parade, drawing one of the loudest cheers from the audience as well as dignitaries like President Ram Nath Kovind and ASEAN leaders. Another proud moment is for the citizens of Belagavi as Shruti Avarolli-Patil a native of Belagavi was part of the 113 women team which performed the stunts. Over a 100 women riding as many as 26 350cc Royal Enfield Bullet motorcycles enthralled the spectators many of whom — men, women and children — were on their feet and clapped throughout the display. Shruti is from Ganeshpur, Hindalga and she is married to Suraj of Shahpur who is also serving in the army. Shruti’s father retired as a major from the army. Shruti is currently working as a constable in the Border Security Force and was inducted into the BSF in 2012. Its is definitely a moment of pride for the citizens of Belagavi and we are proud of you Shruti..
Congratulations, you have made Belagavi and our country proud.You are an inspiration to the young generation. Congrats Shruti. We need to be proud of her achievement.